GuitarControl.com released a new video guitar lesson from GuitarControl.com instructor and creator Claude Johnson. 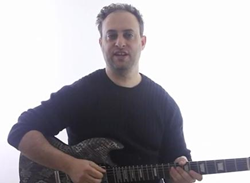 In this guitar lesson, now available on YouTube.com, Claude Johnson teaches some rhythm guitar chordal concepts. “Today I want to show you some chordal concepts”, says Johnson. Claude starts off this easy beginner rhythm guitar lesson by demonstrating a variety of chord voicing’s for A Major including; open position, barre chord and triads. “There is one particular voicing I want to show you”, says Johnson. Claude demonstrates this voicing for A Major as follows. 7th fret of the 4th string with 3rd finger, 6th fret of the 3rd string with 2nd finger and 5th fret of the 2nd string with first finger. Johnson continues by demonstrating how to alter this voicing to make suspended chord variations of this shape. The cool thing about this shape is that it is movable, meaning that you can change the key of it by simply moving it up or down the neck to different frets. Claude says that he covers this concept in more detail in his course “Killer Guitar Control Secrets”. The course that Claude mentions as well as guitar TAB’s for this easy beginner rhythm guitar lesson can be found at GuitarControl.com. GuitarControl.com is the leader in modern guitar instruction. It’s packed with recourses including articles, video lessons, and the best videos in the business for the beginner to the advanced guitar student taught by the best instructors out there. Weather you are into the blues, rock, jazz, metal, folk, or anything in between, they have you covered.